Some of Lord Krishna’s transcendental pastimes may seem hard to swallow. But there’s a sound explanation. If I were to tell you I knew a story about a boy who swallowed a raging forest fire to save his friends and relatives, you’d probably think it was a fairy tale. Boys don’t swallow forest fires. If I were to tell you the story was about how God swallowed a raging forest fire, you might consider more seriously the possibility of the story’s being true. God has been known to part seas, hold forth from clouds, and demolish mighty empires. So why not inhale a forest fire? The fact is, the short story I am going to tell is about an attractive young boy who inhaled a raging forest fire to save His friends and relatives. But it’s not a fairy tale. It’s a true story. 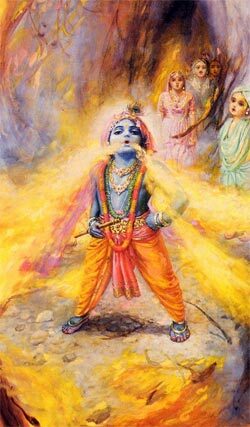 You see, that young boy is the Supreme Personality of Godhead, Lord Krishna. Let me explain. The Vedic literatures describe three levels of God realization. On the first level, the transcendentalist realizes God as Brahman, the effulgent, all-pervading spirit, and he realizes that he too is eternal spirit, different from the temporary, physical body. This is not to say, as many transcendentalists mistakenly conclude, that we are God, but that we have the same eternal, spiritual nature as God. Most currently popular conceptions of God fall within the categories of Brahman and Paramatma realization: God is understood to be the omnipresent and omniscient Supreme Being, the almighty creator and ruler of the universe, the provider of our daily necessities, the overseer and stem judge of our deeds; He is the Great Cosmic Scorekeeper, fully absorbed in His unlimited administrative duties. These conceptions of God, while correct, are incomplete. There is a third and higher level of God realization, known as Bhagavan realization, in which we understand that God is neither first and foremost the controller of this material world nor the servant of our desires. God is the Supreme, the one master of all. How could He be obliged to act as our servant or simply as a cosmic administrator? The Vedic literatures inform us that God, in His topmost feature as Bhagavan, resides in His eternal abode, beyond the material world, where He enjoys blissful pastimes with His pure devotees. In that transcendental abode He is known as Krishna, the all-attractive Personality of Godhead, and although He is the oldest of all, He appears eternally as a fresh youth. Brahman, Paramatma, and Bhagavan are progressive realizations of the same Supreme Person. Brahman is the effulgence of Krishna’s transcendental body. Paramatma is Krishna’s personal expansion through which He creates and maintains the material universe. And Bhagavan is Krishna’s original form as the Supreme Personality of Godhead, the source of all other features of God. People sometimes argue that God cannot be a person. If He were, they say. He would be limited and imperfect like us. But the Vedic literature answers that although God is an individual person; we cannot compare our personalities to His in every respect. He is the greatest person and has no limitations or faults. Because He is the origin of everything, He necessarily possesses everything. If He were merely an impersonal being, He would be lacking the most valued of all assets: personality, or individuality. And how can the Supreme lack anything? Bhagavan Sri Krishna occasionally appears in human society to display His intimate pastimes. To play the part of a human being, He descended five thousand years ago as the son of one of His devotees. He grew from childhood to boyhood to youth—but no further. When He spoke the Bhagavad-gita to Arjuna on the Battlefield of Kurukshetra, He had been on earth for 125 years and had many children and grandchildren. Yet He looked no older than twenty or twenty-five. The residents of Vrindavana were on the topmost level of Bhagavan realization. They knew and loved Krishna as their dearmost Friend and as their affectionate child. Although they were sometimes aware that He was the Supreme Personality of Godhead, that fact was not important to them. Attracted by His beauty and by His loving dealings, they lived only to serve Him and to please Him. “Krishna may or may not be God” they would think, “but we want to serve Him just because He is such a wonderful boy.” Even when they called out to Him in fear of the fire, addressing Him as the Supreme Personality of Godhead and asking Him to save them, they were thinking of Him primarily as their intimate friend. Hearing the distressed cry of His own townspeople, and understanding that they were depending completely upon Him, Krishna felt compassionate and immediately swallowed the forest fire. Although He was playing the part of a human being, whenever He desired He would display the opulences and power that proved He was God. In the Bhagavad-gita Krishna explains that He rewards us according to our degree of surrender. To the atheist, who denies the very existence of God, Krishna remains obligingly invisible. To those persons who approach Lord Krishna to request that He fulfill their material desires, He reveals Himself as the Almighty Father. But to those who worship Him only to please Him, without any desire for their own gratification, He is eternally the most loving friend. He displays His earthly pastimes, such as swallowing the forest fire, to awaken in all of us an ambition to attain this transcendental friendship.